Clyde Shelton (Gerard Butler) is an upstanding family man whose wife and daughter are brutally murdered during a home invasion. When the killers are caught, Nick Rice (Jamie Foxx), a hotshot young Philadelphia prosecutor, is assigned to the case. Over his objections, Nick is forced by his boss to offer one of the suspects a light sentence in exchange for testifying against his accomplice. 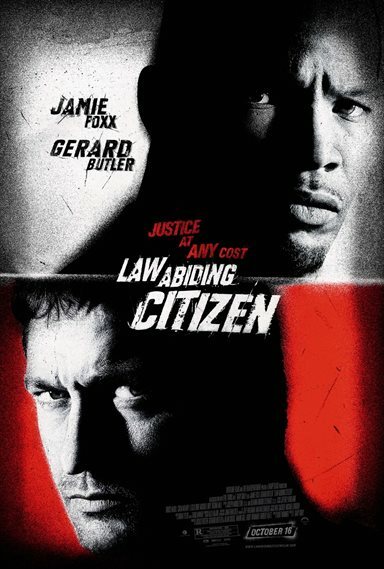 Download Law Abiding Citizen in Digital HD from the iTunes store. Law Abiding Citizen images are © Overture Films. All Rights Reserved. As Americans we expect our judicial system to protect us from the most hardened criminals. Those who violently break our laws should be locked behind bars to keep the innocent people of this country safe. At least that is what we hope would happen. Unfortunately, due to loopholes and prison overcrowding, this isn't always the case. Well, imagine what would happen if the victims of those criminals took their revenge and got their own kind of justice. What if one of those people not only wanted to punish the criminal but the entire flawed system that let the offender go free? Enter Clyde Shelton (Gerard Butler; 300). In Law Abiding Citizen Clyde is that victim out for Justice. Ten years ago, Clyde watched as his wife and young daughter were murdered by two men who broke into their house, bound and gagged them and tabbed them. Clyde, being the lone survivor, wanted justice of course and waited to see the men who perpetrated the heinous act brought to justice. Since Clyde blacked out during the attack he wasn't considered a viable witness and it seemed all the evidence was circumstantial. Then one of the criminals, Darby (Christian Stolte; Chicago Fire) testified against the other, Ames (Josh Stewart; Interstellar) resulting in the death penalty for one and only three years in prison for Darby, who was actually the one who committed the crimes. Fast forward ten years and Ames is about to be executed while Darby is out of jail. The prosecutor, Nick Rice (Jamie Foxx; Django Unchained) who convinced Clyde to let Darby take the plea deal, sits and watched as Ames's death goes horribly wrong. A day later, Darby ends up dead and dismembered and Rice knows Clyde is the one who did it but he can't prove it. The next several days is a deadly game of cat and mouse as Clyde systematically takes out everyone who let him down. Those associated with Darby and Ames's case. As Rice struggles to build a case as time runs out. Finally, Rice figures out what is going on and stops Clyde the only way he knows how but not before Clyde proves the ineptitude of our judicial system. What starts out as an interesting premise quickly descends into a series of improbable situations that makes the viewer want to roll their eyes in disgust. While the scenarios are rather interesting and thought out, the events that occur are highly unlikely, especially in the sequence necessary for Clyde to pull off his plan. This makes the story terribly unbelievable which leads up to the completely unrealistic ending. It seems as if Kurt Wimmer (The Recruit) painted himself into a corner and could quite figure out how to get out of it. The 4K Blu-ray has a great video quality with 2160p resolution and 2.40:1 aspect ratio. While it is not that much of an improvement over the traditional Blu-ray it has a few moments shine. The Dolby Atmos audio is rich and deep and compliments the video nicely. The effects make good use of the surround sound channels leaving the dialog to sit comfortably in the center. There are a number of extras on both the 4K and Blu-ray discs and include: The Justice of Law Abiding Citizen, The Law in Black and White: Behind the Scenes, Preliminary Arguments: The Visual Effects of Law Abiding Citizen (5 featurettes), The Verdict: Winning Trailer Mash-Up. Theatrical Trailer and Audio Commentary. Law Abiding Citizen is an interesting idea but gets lost somewhere along the way. It also isn't a showcase piece for either of the leads thought Butler certainly fares better than Foxx here who seems flat in his performance. For those who like a thriller with some interesting and unique gory elements, this film is one they may want to purchase, Especially with the upgraded video and audio of the 4K disc. Otherwise, watch it once and move on.